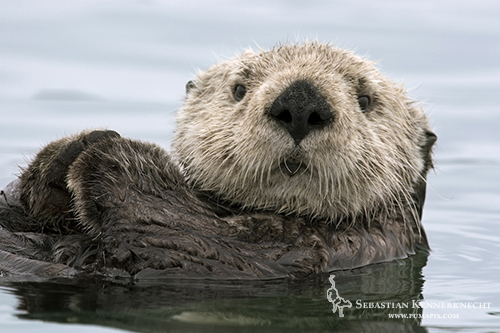 This Endangered Neighbor was taken off the US endangered species list in 2009 due to their population rising to what authorities consider to be large enough numbers. 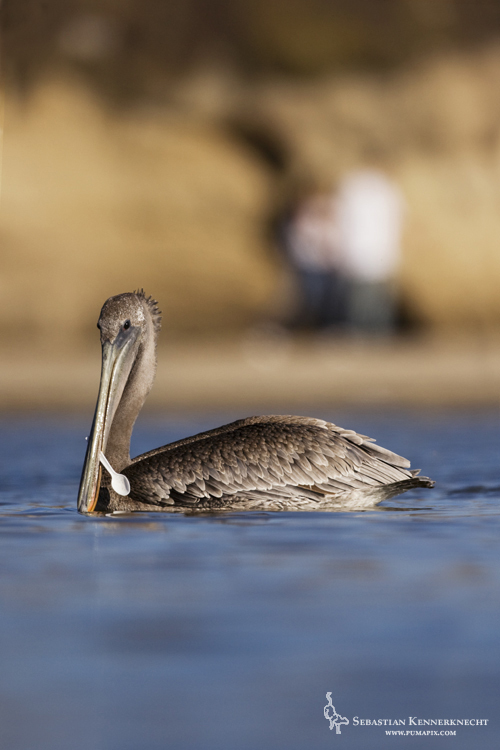 As we all know, this doesn’t mean they are in the clear, but so long as we make sure we don’t repeat history, Brown Pelicans should have a stable future. 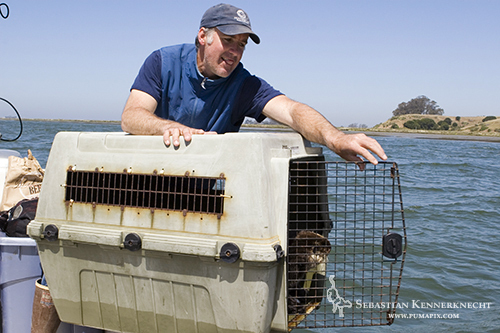 To do this, we need to look at that history to see how we got Brown Pelicans in trouble in the first place. DDT was one of many contaminates released into the environment after world war II. The problem with DDT was (and still is) that it causes thin egg shells. 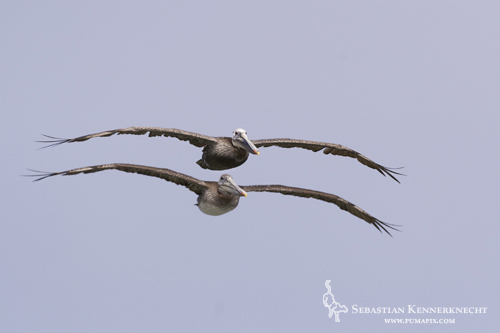 Brown Pelicans incubate their eggs by standing on them. 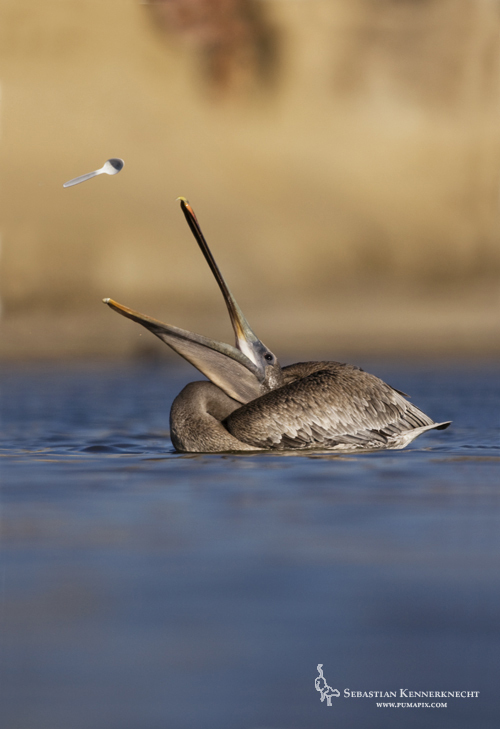 Because of the thin egg shells caused by the pesticide, pelicans were literally crushing their own eggs. In 1969 only 12 of 300 nests contained whole eggs on West Anacapa Island (the only breeding colony in California), the rest were crushed. In fact, the nearshore waters of southern California have experienced the highest levels of environmental contamination by DDT anywhere in the world. This was not only caused by local agriculture, but by the Montrose Chemical Company which was discharging hundreds of pounds of DDT directly into the southern California oceans. 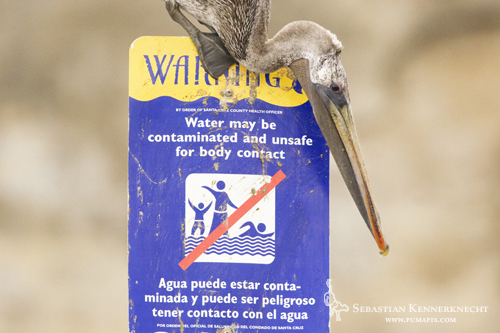 In 1972 the use of pesticides like DDT was banned in the US (though we are still the number one producer of DDT, now shipping it abroad), which was probably the biggest historical factor in bringing Brown Pelicans back. As you can see from the image above, chemical pollution is still a problem, not from DDT, but from agricultural and industrial run-off. Plastic pollution is a constantly increasing modern threat since pelicans often consume them, thinking it is food. 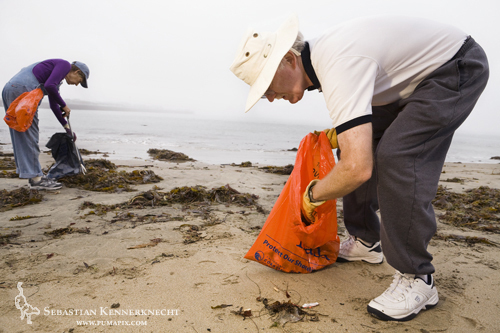 Save our Shores reports that they pick up 60 lbs of trash per beach clean up. That is nuts!!! Not only that, but they average around 385 lbs of garbage per river clean up, so you can imagine how much trash gets swept into the ocean that we simply don’t even know about. The nice part about this step, is that in reality, it is relatively easy. 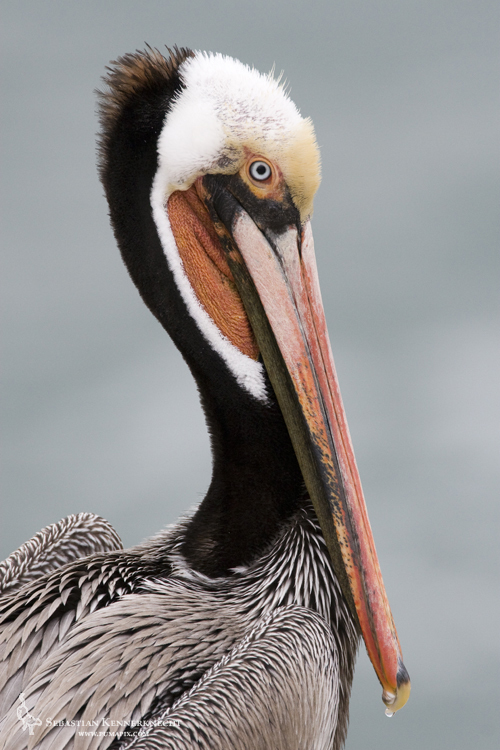 There are a few different easy steps you can take to help Brown Pelicans survive. – Buy re-usable bottles and bags, eliminating plastic bags and bottles. – Throw your trash away in proper containers, but re-use as much as possible. …. see, all those steps are super easy! 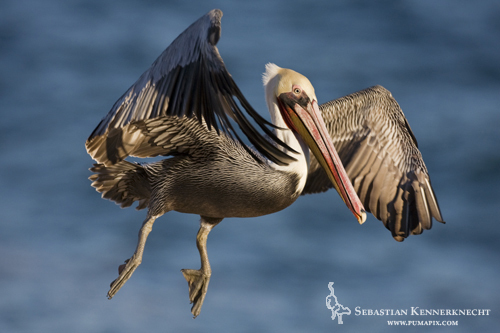 If we all take these small steps we can ensure to be graced by the beauty of Brown Pelicans for years to come! 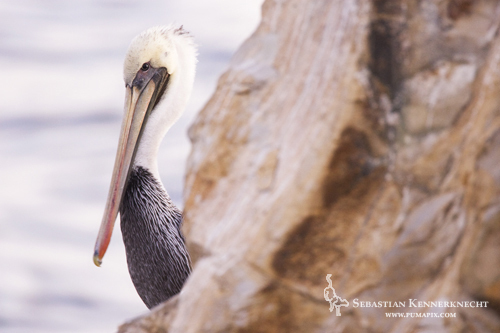 To see more Brown Pelican images, besides the images below, visit the Brown Pelican Portfolio! 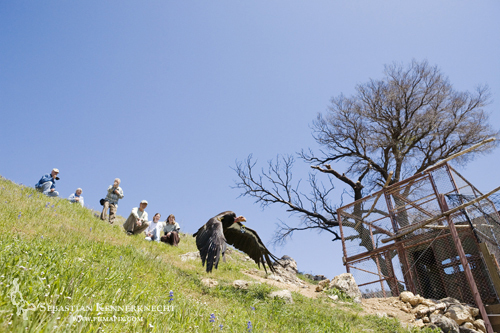 Our most Endangered Neighbor is the California Condor with less than 200 individuals in the wild (There are about 181 in captivity). 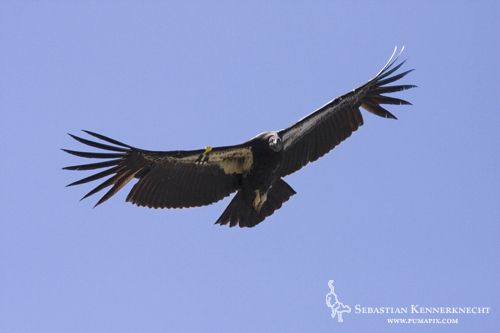 Like the Sea Otter, the low California Condor numbers are due mainly to historical reasons. 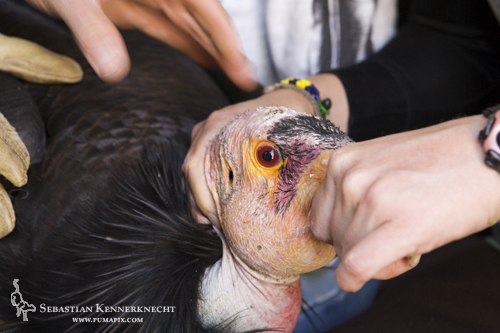 Many were shot since they were seen as threats to livestock (sadly not true as they are strict carrion eaters) and for museum specimens. Then, as for so many other bird species, came the problem of pesticides, specifically DDT. It caused their egg shells to be too thin, causing them to break. 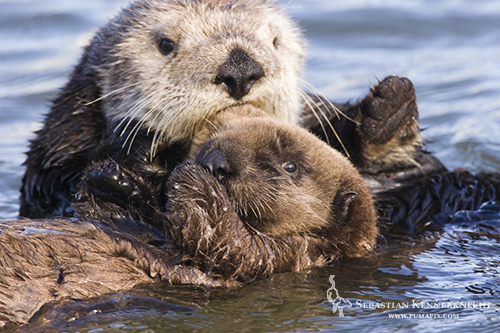 Though these guys are not as cuddly and cute looking as our beloved otters, there are still people who are devoting their life to saving this amazing species. 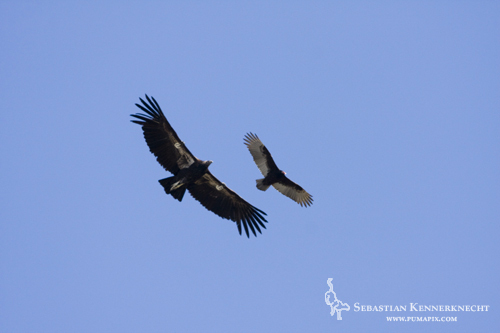 Mainly, the people from the Ventana Wildlife Society‘s Condor Project are responsible for their increase in numbers by managing and conducting a few different projects. 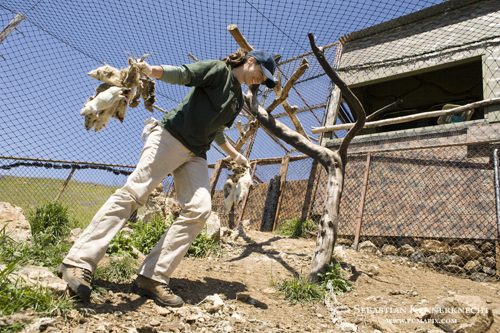 They (here Lyla Hunt) also get to clean out the dead rats used as food for the California Condors in their holding pen, Big Sur, California – yummy! 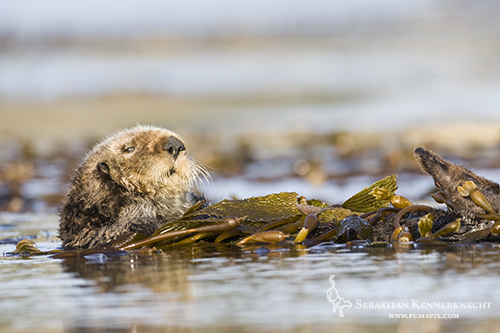 In fact, the wild flock in central California, aka along the Big Sur coast is a direct result of their dynamic efforts. 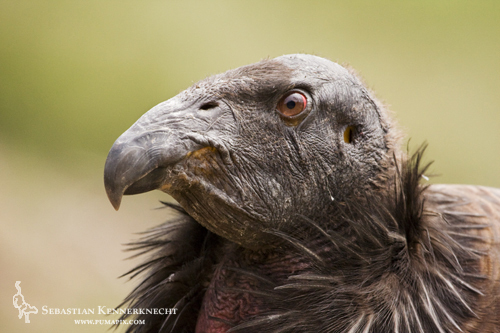 Now as always, there are plenty of little steps we can all take to help condors out. Trust me, if for no other reason than this one, you want these guys to survive to see one of them soar near you. 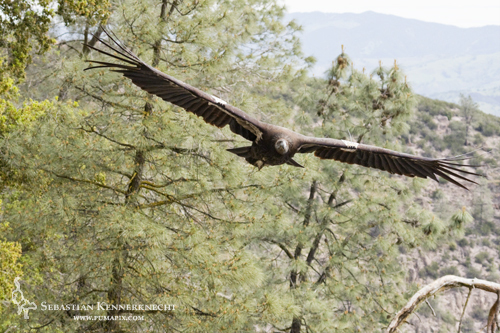 Their impressive nine foot wing span is awe inspiring! So here are the steps you and me should be taking! 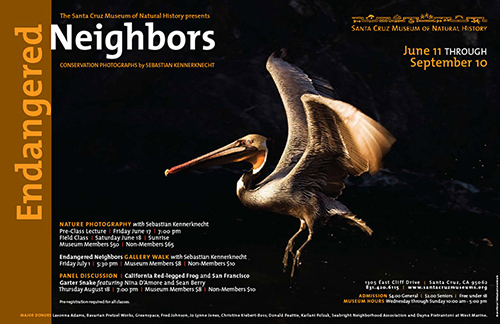 As you guys now, the Endangered Neighbors exhibit recently opened at the Santa Cruz Museum of Natural History. The whole point of the exhibit is to get people aware of our local endangered species, why they are endangered, what people are doing to protect them, and what easy steps we an all take to ensure their survival. 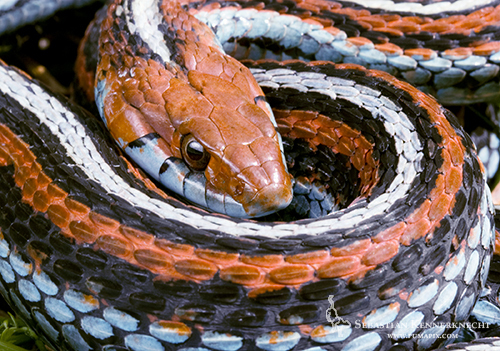 So, let’s get a closer look at one of our local Endangered Neighbors, the San Francisco Garter Snake. 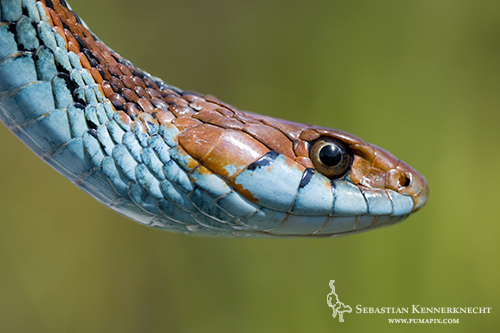 The San Francisco Garter Snake (Thamnophis sirtalis tetrataenia) may be one of the most beautiful snakes in the US, if not the world. Of course this is just my opinion but look at it, it is absolutely gorgeous. (Even Robert Stebbins called it “the most beautiful serpent in North America”). 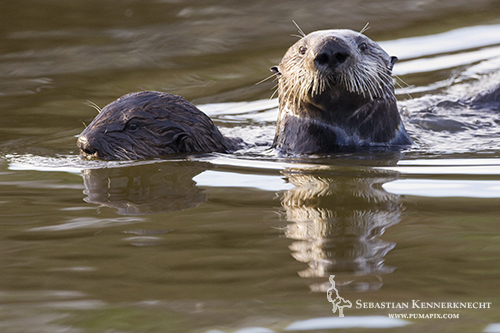 These gorgeous creatures are almost exclusively found in San Mateo county, along the base of the Santa Cruz Mountains. Ano Nuevo State Reserve is one of the only remaining publicly accessible spots where this snake can be seen. 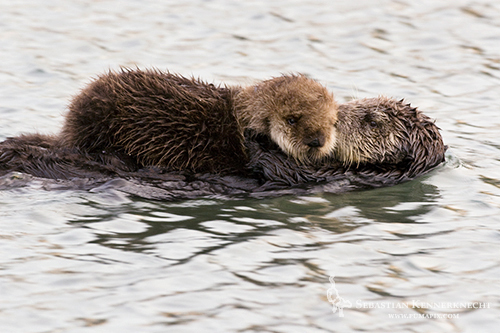 Their exact population numbers are unclear since most of their preferred habitat is on private land and population surveys have not been conducted. 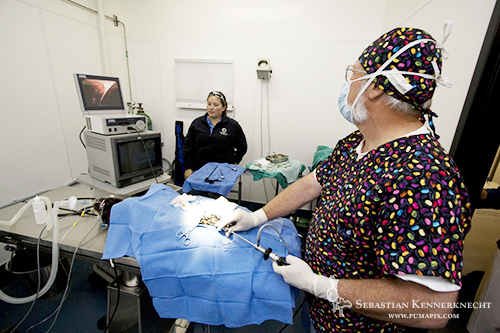 The best estimates are a total population of less than 5000 individuals. This is far too low of a number, and I think it proves the point that we need to desperately be concerned for this species. 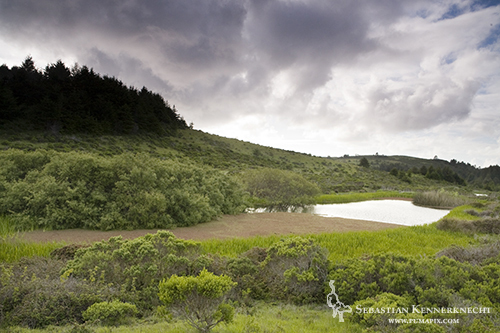 Their preferred habitat is a landscape of densely vegetated ponds with some minor upland components. Cattails, spike rushes, and bulrushes are plants surrounding the pond edges and are preferred by the snake for cover. The upland components are sometimes used for estivation during the dry summer months where the snakes utilize rodent burrows. Primarily though, the snakes are deeply reliant on ponds since they use it as an escape path and this is where they also hunt their primary prey, the threatened California Red-legged Frog. 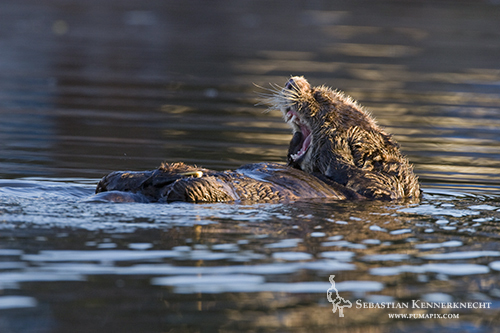 Their habitat is lost due to urban, commercial and agricultural development. The good thing is that there are a couple of organizations that are concerning themselves with the well-being of this beautiful reptile. 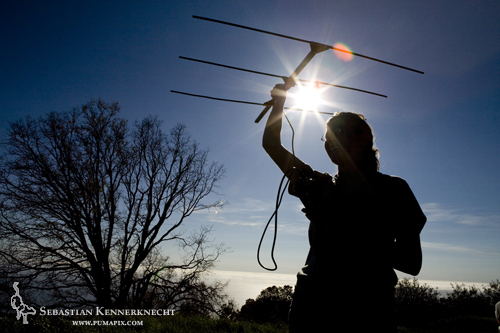 The Peninsula Open Space Trust (POST) is actively managing land and purchasing more acres that the snake calls home to increase the chances that this snake will have suitable habitat in the future, something incredibly crucial in this area with the Bay Area human population only increasing in size. The San Francisco Zoo is conducting a captive breeding program with the goal of hopefully releasing some individuals back into the wild; and finally USGS is conducting research on POST land to get a better understanding of the ecology of this snake and to get some basic population estimates. Do not disturb or handle individuals (it is illegal), and report anyone observed handling SFGS without a permit. Promote land management (burning, grazing, mowing, etc.) practices that maintain or create marshes and ponds with emergent (not woody or closed canopy) margins, with unmowed (or mowed at a high (6″ or greater) grass height) surrounding uplands. Some trees and shrubs are OK, but a closed canopy forest is probably not. 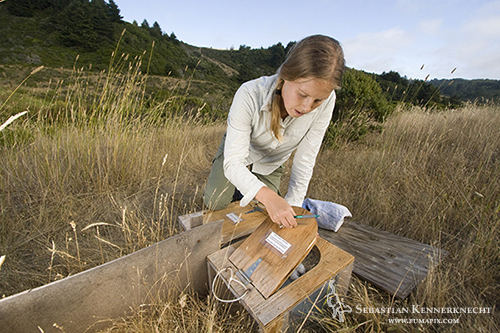 If you don’t own land, contribute to local parks or organizations that manage land appropriately for wildlife, including SFGS (Ano Nuevo State Reserve and the Peninsula Open Space Trust are good examples). 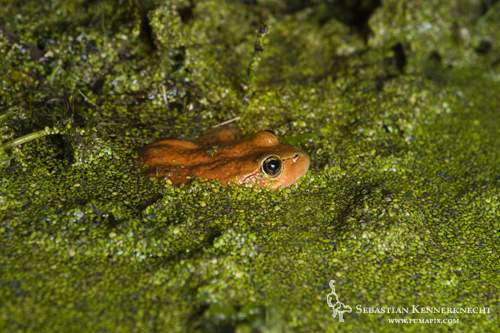 Promote conditions that foster high native amphibian (SFGS prey) abundances. This would include such things as promoting the above habitat conditions and minimizing pesticide, herbicide, and fertilizer use (including anything that goes into the sewers and especially storm sewers). Buying organic foods is something that consumers can do even if they do not grow crops or have a yard. This also means not releasing fish or non-native amphibians into the environment where they can have detrimental effects on native amphibians through predation, competition, or spreading disease. 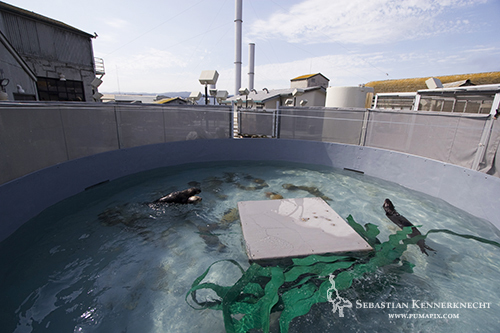 If driving in or near SFGS habitat, drive slowly and with care to avoid running over SFGS. Properly disposing of garbage to help control raccoon populations. So go out and look for this snake yourself, I am convinced that once you see one yourself you too will fall in love with it and will want to conserve this amazing animal. 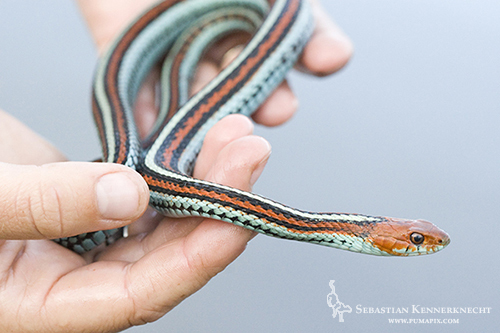 To see more images you can check out the rest of my San Francisco Garter Snake Portfolio.